A recent study, published in the journal PLOS ONE, shows that marine systems are apparently becoming gradually less able to support seabirds. The study focused on populations that scientists had monitored at least five times between 1950 and 2010, which accounted for 19 percent of the world’s seabird population, encompassing 162 species. They found the monitored (19%) portion of the global seabird population to have declined overall by 69.7% between 1950 and 2010. The researchers found that during that period the monitored seabird populations declined by 69.7 percent. Human activities such as fisheries and pollution are threatening the world’s marine ecosystems, causing changes to species abundance and distribution that alter ecosystem structure, function and resilience. In response, increasing numbers of marine biologists and managers seek to achieve management measures allowing the persistence of healthy, productive and resilient ecosystems. Seabird population changes are good indicators of long-term and large-scale change in marine ecosystems because seabird populations are relatively well-monitored, their ecology allows them to integrate long-term and large-scale signals. So, the implication is that our oceans are not supporting seabirds, and they are sick! Threats include entanglement in fishing gear, overfishing of food sources, climate change, pollution, disturbance, direct exploitation, development, energy production, and introduced species (predators such as rats and cats introduced to breeding islands that were historically free of land-based predators). These are all related to lethal “human activities”. 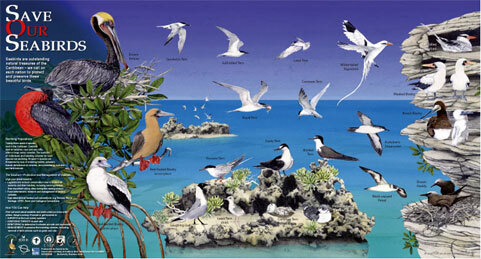 The IUCN Red List of Threatened Species indicates that one third of seabird species are threatened with extinction, one half are known or suspected to be in decline, and at least four species are extinct. One big game-changer for seabirds over the last century has been the industrialization of fishing, which has depleted seabirds’ food sources. Other threats include entanglement in fishing gear and oceanic pollution. Because of the El Nino weather phenomenom that is happening across the Pacific, scientists say the ocean is just too warm right now. “It really limits the productivity of the ocean from the base level so in the case of the common murre which feeds on small fish, these are not as plentiful as they normally are during a normal ocean condition year,” explained Herman Biederbeck, ODFW biologist for the north coast. Our oceans are dying. Time is rapidly running out for the world’s oceans and the creatures that live in them as the Earth’s climate continues to warm, say scientists. Their analysis showed that ‘business-as-usual’ would have an enormous and ‘effectively irreversible’ impact on ocean ecosystems and the services they provide, such as fisheries, by 2100.